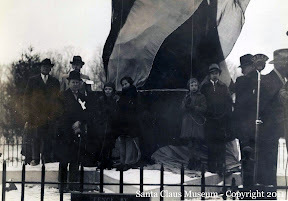 It was 76 years ago today that droves of people braved a harsh winter storm to watch the great unveiling of the 22 foot tall Santa statue in our town of Santa Claus, Indiana. The statue was dreamed up by Chicago businessman and philanthropist Carl A. Barrett. The Santa statue was the focal point of his 32-acre Santa Claus Park, one of the first developments looking to capitalize on our town’s unique name. 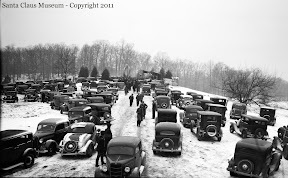 Undoubtedly a rare site in tiny Santa Claus, cars were parked bumper to bumper for the statue unveiling. A harsh winter storm also began blanketing the region with snow that day. The Santa statue was designed by artist Ralph Seymour Fletcher and was constructed at the Chicago Foundry. It was then transported by lowboy trailer to its current resting spot on a knoll near the old town settlement of Santa Claus. Barrett originally billed the statue as being made from solid granite. It was later discovered to be constructed from 40-tons of concrete with a granite-like finish. Santa stands on a five pointed star facing due east to the town of Bethlehem. 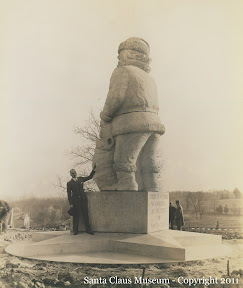 Carl A. Barrett stands next to his completed Santa statue sometime in the fall of 1935. The original town settlement of Santa Claus can be seen down the hill and looking south from the statue. 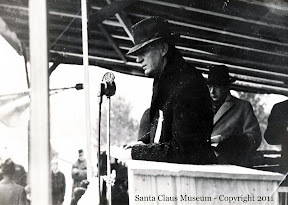 The unveiling of the Santa statue was undoubtedly one of the biggest events in town history and was heard as a special hour-long radio broadcast from coast to coast. Louisville radio station WHAS had to run special telephone lines into Santa Claus just to transmit the special broadcast. The Columbia Broadcasting System donated the block of time so the dedication could be heard nationwide. Four people were lucky enough to unveil the statue to the large crowd. The Courier-Journal, Louisville Times and Evansville Courier newspapers all sponsored a Christmas jingle competition. Aimed at children, entrants were encouraged to “fill in the blank” on several Christmas themed jingles printed as a newspaper insert. Sara Carter, a 9 year old girl from Louisville, and Glenn Dean, a 14 year old boy from New Albany won the contest in the Louisville area. Bobby Schweigert and Doris Sills won the jingle contest in the Evansville area. On the command of the master of ceremonies, the four winners gripped braided cords that caused “spangled drapes” to fall off the Santa statue and reveal what Barrett had worked so long to fund-raise and create. A living legacy to Barrett and all the people who believe in the true spirit of Santa Claus, the statue recently underwent a $100,000 restoration paid for by the Koch family. The Historic 1935 Santa Statue still stands in its original spot and continues to be enjoyed by townspeople and visitors traveling through the area. Do you have any memories or photos of the Santa Statue? Please leave us a comment and share. I live in Vincennes, Indiana and am very interested in Indiana history. While looking through microfilm recently at the Knox County Public Library in Vincennes, I stumbled across an article from the 1930's that stated that the "Ancient Log Cabin" that was moved to Santa Claus, Indiana by Carl Barrett was originally built in Vincennes, Indiana. It stood for ions on Willow Street in Vincennes. The article went on to say that a Vincennes resident when visiting Santa Claus spoke with the residents there about the history of the cabin (maybe of French, post-on-sill construction?). I was wondering if you have any photographs of the old cabin? I also am wondering when or if the cabin was razed? I would really appreciate a reply. Thank you. Norbert Brown, Vincennes, Indiana. Hi Norbert! I'm happy to look into this for you. My email address is ethompson@santaclausmuseum.org and I will follow up via email. Thanks very much! Will do! 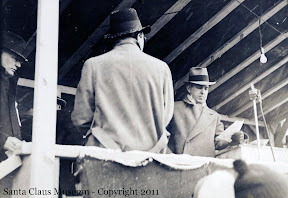 The artist referred to above for designing the statue is Ralph Fletcher Seymour, my great uncle. He refers to the statue in a book he wrote, "Some Went This Way". I now have a great reason to visit Santa Claus, Indiana! Hi Sherry! What a fantastic family connection. Please let me know if you make it down to Santa Claus. I would love to show you around the Santa Claus Museum & Village! i have the prototype of the statue,it is the same as the one in the photo.it is 14 in tall and brass coated.has the same writhing on the sides of the bottom.and is sighed by carl barnett,have had it for fifty years. i lived in evansvillie for about four years.i was working at ohio valley container on night shift.i ran a add in the newspaper to clean out building and houses.in the day to make extra money,i had a big truck.i was cleaning out the old ridgeway building downtown,the upper floors.it looked like it had been a printing shop at one time.i found the santa clause in a wood box.with some other junk.after i kept it for a while i went to santa clause land one weekend with my kids,saw the big one there and it is the same as the other.i think the year i found it was 1965 or 1966.i will take a photo of it and try to post it on your site.